it was his first big murder case and one of the bloodiest and most violent crimes LAPD detective Danny McGuire would ever encounter. Andrew Jakes, an elderly multimillionaire art dealer, had been brutally murdered in his Hollywood home, his lifeless body tied to his naked young wife. Raped and beaten, the lovely Angela Jakes had barely survived the attack herself. Gazing into her deep, soulful eyes, Danny swore that he’d find the psychopath behind this barbarous act. But the investigation didn’t turn up a single solid lead, and within days of Angela’s release from the hospital, the stunning young widow Danny’s only witness had vanished. For ten years Danny McGuire could not forget the sweet face of Angela Jakes and the terrible crime that had shattered her life; his obsession with her nearly cost him his sanity. Now in France, thousands of miles from the past with a new life, a new job with Interpol, and a ravishing new wife he’s happier than he’s ever been until he meets Andrew Jakes’s estranged son, Matt Daley. Curious about his father’s murder, Matt has been digging into the cold case and made some shocking discoveries. Three killings nearly identical to his father’s have taken place across the globe. The victims were elderly, newlywed millionaires, their young wives assaulted. And in each case the widow, the sole beneficiary of the will, donated her newfound wealth to children’s charities and then vanished. Could it be true? Had the Jakes killer struck again? If so, Danny knows he must tread carefully or risk losing everything for good. The evidence points to a single killer a brilliant and ruthless criminal who travels across the globe under a string of assumed identities, cleverly keeping one step ahead of the law. Joining forces, Danny and Matt pursue this intriguing shadow from Los Angeles to London, New York to Italy and the French Riviera, in a tantalizing game of cat and mouse filled with promising leads and frustrating dead ends. When another murder fitting the profile occurs, Matt heads to Hong Kong, hoping to get answers from the latest widow, Lisa Baring, and perhaps uncover the hard evidence they need. A fast-paced story full of mystery, glamour, excitement, and spectacular twists that build to a stunning ending, Sidney Sheldon’s Angel of the Dark is quintessential Sheldon from first page to last. This entry was posted in English Novels, Forthcoming Books. General Stanley McChrystal, the innovative commander of international and US forces in Afghanistan, was living large. Loyal staff liked to call him a ‘rock star’. During a spring 2010 trip across Europe to garner additional Allied help for the war effort, McChrystal was accompanied by journalist Michael Hastings of Rolling Stone. For days, Hastings looked on as McChrystal and his staff let off steam, partying and openly bashing the Obama administration for what they saw as a lack of leadership. 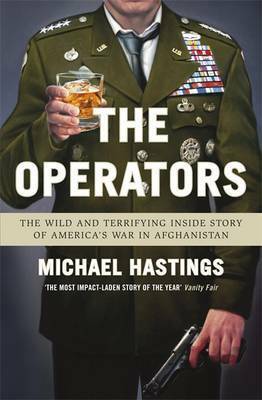 When Hastings’ piece appeared a few months later, it set off a political firestorm: McChrystal was ordered to Washington, where he was unceremoniously fired.In The Operators, Hastings gives us a shocking behind-the-scenes portrait of Allied military commanders, their high-stakes manoeuvres and often bitter bureaucratic in-fighting. He takes us on patrol missions in the Afghan hinterlands and to hotel bars where spies and expensive hookers participate in nation-building gone awry, drawing back the curtain on a hellish complexity and, he fears, an unwinnable war. This entry was posted in Current Affairs/Political Books, Forthcoming Books, Fresh Arrivals. This entry was posted in Forthcoming Books, History, Oxford Books. This entry was posted in Current Affairs/Political Books, Forthcoming Books, History, Oxford Books. 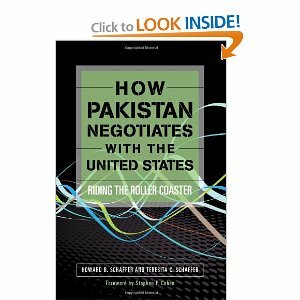 How Pakistan Negotiates with the United States analyzes the themes, techniques, and styles that have characterized Pakistani negotiations with American civilian and military officials since Pakistan’s independence. Pakistan’s view of the world begins with the 1947 partition of India that created it, and the subsequent insecurity. (Pakistan is one-seventh the size of India.) Kashmir, ruled by India despite a Muslim majority, is an ongoing source of potential conflict between the two. India’s support for the breaking away of East Pakistan in 1971 is another ongoing sore point with Pakistanis. Pakistan – U.S. relations over the past 60 years have been marked by highs and lows, with three marriages and two divorces. The first divorce came in 1965 during the Pakistan – India war when Pakistan used U.S. provided weapons which Washington had warned them against using vs. India. Pakstan’s nuclear program caused the second divorce, leading to the cut-off of assistance in the 1990s. Both instances involved Pakistan’s refusal to accept U.S. conditions, and have led Pakistan to see the U.S. as an unfaithful ally – especially in comparison with China. Pakistanis have also come to see the U.S. becoming more aligned with India as a means of counterbalancing China. Thus, Pakistan is not looking towards China, oil-rich Arab nations and other Muslim countries for backing. Pakistan sees the U.S. as a counterweight to India and its neighbors, and the U.S. tries to use Pakistan to gain influence in the region. More recently, the U.S. has attempted to partner with Pakistan based on the premises that our and their goals in Pakistan are the same, and that both nations need the other. Authors Schaffer contend that this is only half true. Both nations would like to see a peaceful Afghanistan, but U.S. concerns over al Qaeda in Afghanistan are of much less concern to Pakistan than preventing India from having significant influence there. (India’s consulates in Jalalabad and Kandahar don’t help.) Working against the U.S. is Pakistan’s belief that U.S. presence will soon be gone. Consistent with Pakistan’s lower priority for ridding the area of al Qaeda are U.S. suspicions that the Pakistani government knew of Osama’s location in Abbottabad; the raid also angered and embarrassed the Pakistan army. The U.S. decision to withhold $800 million of military aid from Pakistan, as well as our drone raids that have killed Pakistani soldiers and civilians have strained relations to the point that Pakistan has now closed U.S. access to Afghanistan through the Khyber Pass. Pakistan has more than 100 nuclear weapons, is building more rapidly than any other nation, and has a population larger than Russia. Pakistan’s military, the dominant ruling force, sees militant groups as actual or potential assets – thus, it will continue to provide sanctuary for ‘friendly’ militant groups. Bottom-Line” The U.S. has tried to buy Pakistani cooperation with $20 billion in aid since 9/11. Adding criticism to that aid hasn’t helped. Pakistan knows the U.S. fears Pakistan’s collapse, or halting its aid vs. Afghanistan. Only 17% of Pakistanis had a favorable view of the U.S. in 2010, and 63% disapproved of the 2011 raid that killed bin Laden. Given our moving closer to India, and that being Pakistani’s #1 concern, the situation is not likely to improve in the near term. This entry was posted in Current Affairs/Political Books, Forthcoming Books, Fresh Arrivals, Pakistan. With each passing day, Pakistan becomes an even more crucial player in world affairs. Home of the world s second largest Muslim population, epicenter of the global jihad, location of perhaps the planet s most dangerous borderlands, and armed with nuclear weapons, this South Asian nation will go a long way toward determining what the world looks like ten years from now. The Future of Pakistan presents and evaluates several scenarios for how the country will develop, evolve, and act in the near future, as well as the geopolitical implications of each. Led by renowned South Asia expert Stephen P. Cohen, a team of authoritative contributors looks at several pieces of the Pakistan puzzle. The book begins with Cohen s broad yet detailed overview of Pakistan, placing it within the context of current-day geopolitics and international economics. Cohen s piece is then followed by a number of shorter, more tightly focused essays addressing more specific issues of concern. Cohen s fellow contributors hail from America, Europe, India, and Pakistan itself, giving the book a uniquely international and comparative perspective. They address critical factors such as the role and impact of radical groups and militants, developments in specific key regions such as Punjab and the rugged frontier with Afghanistan, and the influence of and interactions with India, Pakistan s archrival since birth. The book also breaks down relations with other international powers such as China and the United States. The all important military and internal security apparatus come under scrutiny, as do rapidly morphing social and gender issues. Political and party developments are examined along with the often amorphous division of power between Islamabad and the nation s regions and local powers. Uncertainty about Pakistan s trajectory persists. The Future of Pakistan helps us understand the current circumstances, the relevant actors and their motivation, the critical issues at hand, the different outcomes they might produce, and what it all means for Pakistanis, Indians, the United States, and the entire world. This entry was posted in Best Sellers Books, Current Affairs/Political Books, Forthcoming Books, Fresh Arrivals, Pakistan.